Andy Higgins Blog: Seychelles (Part 1) – An Idyllic Paradise? Seychelles (Part 1) – An Idyllic Paradise? I just returned from a trip to the Seychelles. The main purpose of my visit was because I am considering buying a property on Eden Island but I also set up a Seychelles Offshore company and opened a bank account to house my offshore investments (I used a managing agent called Fidelity to do this). Eden Island (the island in the forefront of the image above before development started) is a special development concession given by the government of the Seychelles whereby all purchasers are eligible to receive residency in the Seychelles (at a cost of Rs50k per person for every 5 years – its almost ZAR 1 : Rs 1 so that’s about 50,000 rand). Although the development of the units on the island is in a very early stage from my visit I am quite impressed with what I saw. It seems to be very professionally managed all round. The question is at over $300k for an entry level one bedroom apartment is it worth it and is the Seychelles the place I want to set up a holiday home? Mahe is about a 5 hour flight from Johannesburg and flights on Air Seychelles cost about R4,400 each return (including all taxes). That means after leaving home, driving to the airport, the flight, collecting baggage and catching a taxi to Eden Island it would take about 8 hours from door to door. Not too bad considering it would take you about the same time or longer to drive from Johannesburg to a holiday home on the North or South Kwazulu Natal coast (granted at a lesser cost). There is no question that the Seychelles is an absolutely amazing place. It is the definition of an idyllic paradise. It does not strike me as being part of Africa but rather reminds me more of the Caribbean from the almost one year I spent working on super yachts in the Caribbean back in 1998/1999. Even the people seem to speak with a bit of a West Indies accent. The people too are fantastic (although definitely somewhat laid back and embrace “da island style” way of life). I met Jose (currently is the only Seychellois with a blog called Seychelles Digital) who took us out for dinner at the boat house at Beau Vallon on the North East side of Mahe. It was very interesting to hear from him first hand what it is like to live in the Seychelles and I hope to return the favour next time he visits South Africa. That said there was an aspect to the Seychelles I did not like – see Part 2. Thank you for your very interresting comments. I'm also interrested in the eden island projet. Do you think, that the buildings will be high enough because of see water rising do to the climatics changes. What do you mean not a part of Africa? Maybe instead of trying to find categories for things, you broaden your own mind and not have such a narrow view of what the people in Africa are like!!! There is nothing more irritating than shallow-minded foreginers who feel the need to visit/live in Africa and start painting all of it's cultures, countries and citizens thereof with the same brush. Barbados and Cuba and Canada belong to the same continent. Do you expect that they would all be the same people? What about China Russia and Iraq? They're all on one continent! So here you have Seychelles and you want to compare it to another African COUNTRY, I find it indicative of the ignorance so pervasive in the understanding of Africa and all the countries within it. It is almost the biggest continent and the 2nd most populous yet you think you can summarize all of Africa's complexities with one sterotype? That you live in Africa is what really makes it more unbelievable. "I spent working on super yachts in the Caribbean back in 1998/1999"
quoting from what you said above. ill le vache in haiti small coastal area quiet a place there called port morgan had first yacht rally there. google it Port Morgan Haiti. Anyway, tgood luck with Seychelles. Just found your seychelles blog, interesting article about buying a property, when I was looking last year there were a number of luxury places on offer, but all a little our of my league.. ho hum, time to save a few more pennies then! I doubt just saving a few pennies would be enough. 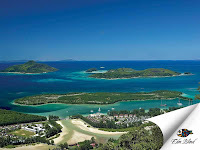 :) Seychelles properties keep becoming more and more expensive. The Seychelles really are a beautiful island paradise, I can definitely see why you would want a holiday home there! Luxury holidays in the Seychelles are fantastic! Forming a Seychelles or nternational Business Company is no longer an uphill task. Seychelles (Part 2) What’s not to like?